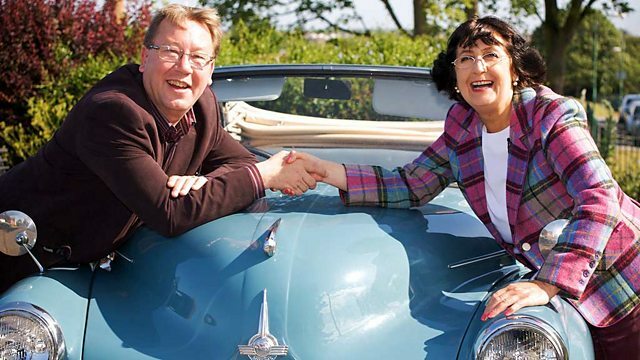 Thomas Plant and Anita Manning cruise around the sunny south coast, heading for an auction in Dorking, Surrey. The aim - to make the biggest profit at auction - but it's no mean feat. and this time they're cruising around England's sunny south coast. Thomas, here we are in Bournemouth. The sea is over there, the sun is shining. -Maybe we could get some buckets. -Buckets and spades. A kiss-me-quick hat. It is a real sort of holiday feeling, isn't it? caused big losses, and he is starting today with only £154.98. Thrifty Anita has now taken the lead with £255.94. -Summertime and the living is easy. Well, the living isn't easy for me because I'm so poor, but you're so rich! I know. I must say, Thomas, I've surged ahead here. but in actual fact I've surged ahead! Surged ahead, and I've sort of surged backwards. and I don't know if you've got a leg to stand on. let's see where our happy pair are off to. all the way to the town of Maidstone, in Kent. 100 miles away in Dorking. You were a wee bit casual in the way you spent your money the last time. I was. You were very careful - that was the right approach. My plan is to follow you again and to spend little. So, now, Thomas has a plan. no prizes for guessing, Robin. What we do need to know before you do start is have you got a licence? -No, I haven't got a begging licence. And keeping up the family tradition is his grandson, Dan. and there's quite a few items catching Thomas's eye. -Very arts and crafts, isn't it? as in a hammer-beating effect. Planished hand-beating. -Certainly could have had that, yeah. -..for brushing off your coat and what have you. -Can I think about that? How much is that? That one is a definitely maybe for Thomas. Now, what has he found out the back? -It's a complete smoker's compendium. ..or a tobacco pot, or ashtray in there. but it's nice being complete. The style of it, there is no damage, and the whole thing is £80. Could Robin simplify the ticket price a bit, perhaps? So, Robin is asking for £100 for the two items. of lots, and then 50 quid on another couple of lot somewhere else. Don't look like that! Don't look like that. He looks as if he is going to throw you out the shop. Listen, I will let you have both bits. That is the smoker's compendium and the coat hook for 70 quid. -You are a very good man. Well, that was a good bit of business, Tom. £50 for the smoker's set and £20 for the coat hook. New Milton and crossed the county line from Dorset into Hampshire. She's here to shop in Serendipity One. And he certainly did, Anita. Here to help us is Nick. -I love your reception committee. Well, yes, he is there to let me know someone is in the door. -He is not a watchdog or anything? -Did he tell you to spend all your money? We will get some out of you. -know what you're going to buy. Now, how about this little fella? This type of thing I find fascinating. I find the simplicity of the carving very, very attractive. and African tribal masks that inspired artists like Picasso. and there are little mother of pearl insets here. ..I'm going to have a go at him. But first, what else can she sniff out? A sign like this is like a red rag to a bull in this game. Bags and boxes, China, bits and pieces. Oh, I can't wait to have a rummage. Get in there and have a good old rummage. This is like access all areas. the really nice bits and pieces. Ah! Now, I love this stuff. This is a piece of Poole Pottery made in the '60s/'70s. It is from the Aegean and Delphis range. It was the time of psychedelic colours. It was a time of Carnaby Street. It was a time of hippies. and Poole reflected the mood of the times in the designs for this range. but what can Anita get it for? It would be lovely to get it for under 20. -Nice and local as well. Well, that's what I was thinking. That's what I was thinking. So hopefully, if you're selling locally, it could be a good thing. Yeah. It's the type of thing that I would have in my house. And, of course, you don't know how much it is. -No, well, that's the rub. £10, that's a bargain. One off. -No more to be said on that. -No more to be said. But what about our little friend? -It's nearly as tall as you. -It nearly is. He can be my wee pal. he is a bit damaged. -What about if we did 40 for you? -40. Still a wee bit dear at 40. -Shall we shake our hands at 30? 30's fine. Thank you very much, Nick. and £30 for the sculpture means plenty of cash left. Watch out for the door dinosaur! for his next spot of shopping. Thomas is off to Warwick Lane Shopping Centre to meet Steve. -Steve, I'm the manager at Warwick Lane in Wickham. Warwick Lane has about 40 dealers and is packed with goodies. I found some vintage skipping-ropes for my new-found fitness. Now, what's that saying about a bull in a china shop? -And barely that, some might say. A pair of glass salt dishes. Handle with care, for goodness' sake. They're cut glass with cut glass rims in the boat shape. Got a tiny bit of wear to them round there. Just got to work out how old they are. I think they're early 19th century. £6 each. £6 each for a pair of early 19th-century salts. around the time of Napoleon's defeat at Waterloo? Incredible! Now, back to something sweet. It's a sugar bowl. and I love the finial. Been made by hand. This finial, this handle here, that is polished ivory. Well, it's a controversial material. But, if formed before 1947, it's legal to buy and sell. Quite a nice thing. So that's something I'm going to think about. I shall go and ask Steve about these, the two things I've picked up. So yes, what can be done on those, if anything at all, please? Well, I'll ring up the sellers and we'll find out. The pair of glass salts is priced at £12. Steve checks with dealer, Mandy, for the best price. -And what about that one there? -The sugar bowl is priced at £15. Steve checks with dealer, Sue. -Would £9 be more acceptable? -Perfect. Thank you very much. -Why didn't I come here fist? -This is brilliant. Thank you. the sugar bowl for £9, and nothing broken. Very bullish of you, Thomas. and home to the Royal Navy Submarine Museum. made to develop this deadly technology. Here to meet her is archivist George Malcolmson. and for ships, but submarines are something really quite different. This looks like a strange creature from the deep. His Majesty's Submarine Torpedo Boat Number 1. It was launched in October 1901.
named after John Philip Holland, an Irish-American engineer. is regarded as the mother of modern submarines. after the Americans allowed the design to be sold. -Yes, we can go in. Have a look through. -Strangely enough, no. I know many who are over six foot. squeezed into this small space, with no contact with the outside world. There would have been a very distinct odour in these submarines. but I believe you have something even smaller to show me. its engineers were getting ever more inventive. as they could sneak in, undetected, to enemy harbours to lay mines. These were very hazardous missions. to Norway, attacking the U Boat facilities in Bergen, and came back. One of the few that came back. Success came at a price, though. -only three completed the mission. -How many men would be in here? Three crew and a diver. only five survived and nearly half of the crewmen were killed. must have been even more dangerous than the big submarines. Were submariners a special type of man? and they had to go through fairly rigorous training. it seems to bind the people together much more strongly. and over 5,000 of them have died serving their country. are what keeps it at the forefront of defending Britain today. That sombre note brings us to the end of day one. Night-night. It's the start of another sunny day on the Road Trip. Well, not quite, but our duo are in Southsea and are in good spirits. sitting beside a beautiful woman, in a lovely yellow sports car? Well, do you know? I have to say, I enjoy the British seaside. And I love things like these gorgeous huts. Yeah, they're great, aren't they? With their lovely pastel colours. There is something magical about the British seaside. -And people all muffled up against the wind. -There's no such thing as bad weather. A very British attitude. Now, Thomas had a trying day yesterday. but still managed to pay out £87 on four items. the glass salts and the Art Deco bowl. That leaves him with £67.98 for the day ahead. spending only £40 on two items. giving her £215.94 to spend today. with a trip to Parmiters Antiques, run by the very charming Ian. -Can I leave my bonnet here? I'll put it on the dog. Anita has a bit of a rummage. These are boots that certainly weren't made for walking. These boots were made for showing off. -I don't think they'd fit me either. -She's given the boots the boot. But time is marching on. What's going to be worth a punt? You know, it's very, I suppose, evocative. that was based on ships and the Navy and so on. who have all been scrunched into their best clothes. -They had to sit there for five minutes. -Sit there for five minutes. -Do we know anything about the HMS Vengeance? Maybe a dreadnought. One of the old dreadnoughts. Ian is very nearly right. prior to the massive dreadnoughts. -What sort of price is a bargain? -Bargain to you - 20 quid. -I like that for 20. I think I'll take that. -That's one down. Now, what else has Ian got? -I've got one for you. -See all this 18th century pottery? -All that, 25 quid the lot. -25 quid for the lot? It's all damaged - guaranteed. ..three, four, five, six, seven. Eight. -No rush, Anita. You just take your time. You can't go wrong, can you? She's thinking about it. How about a double deal, Ian? £40 for that and the frame. -Let's go for it. 40 quid. -If you don't make money, I'll give you a tenner. Another brace of budget buys for Anita. and the HMS Vengeance life saver portrait, also for £20. -and showing him round is Andrew. -It's so windy here, isn't it? Was it windy when we went to France on D-Day? The weather wasn't very good anywhere. I think it was worse than today, though. the civilian population, how did they survive? but they were just as important to the success of D-Day. and the beginning of the liberation of Europe from Hitler's Nazis. and the south coast in early 1944.
and more troops building up and gathering into the area. so there were special security restrictions. often hidden away in a wood. or spies around, it was a lot harder to see them. the camps were sealed, which meant no-one could go in or out. but none of them knew the top secret time and date of D-Day. Surely the Germans had an inkling that we were coming? or an Allied landing somewhere on the coast of Europe was coming soon. The Allies had made no secret of that. were where and when it would be happening. Just as well the Germans never got their hands on one of these, then. It's a step-by-step guide on how to invade occupied France. So when were they given these? but until the last minute, they were sealed up. So in a sealed envelope, which they weren't allowed to open. and actually find out where they were going. Didn't people open them immediately and think, "Oh, what's going on?" and to make sure that the enemy didn't get wind of what was coming. filling the streets with trucks and troops. -to this huge influx of military personnel? huge numbers of troops in the area in the lead up to D-Day. into their house for a bath or to share some food. And, obviously, food was rationed so that was quite a big thing. civilians living along the south coast, and these troops. saw the opportunity for a spot of memento collecting. onto this coat to hold the whole collection together. so it's a great summary of many of those troops who went from Gosport. -No doubt the troops weren't meant to do this. and boats disappeared, leaving an eerie calm. but the towns of the south coast can be proud of their vital role. this time eight miles east to Chichester. Now, Chichester is the county town of West Sussex. and is the final resting place of the composer Gustav Holst. going for a song in Hancock Antiques, run by Peter. And loads of it too. isn't in good condition, so it's probably no use to me. Oh! Heard a wee clink there. I have to be careful. You might feel more at home with Peter's jewellery. I love rummaging through all this. Lovely wee bits and pieces of jewellery. That's a rather pretty piece of agate, Peter. Agate is a popular stone with beautiful striping. This brooch has a ticket price of £40. Can that one be bought for 20? and it's the type of thing that a private lady might fancy at auction. -I can do it for 20. -You can do it for 20? Let's do it for 20 then. That's lovely. Thank you very much, Peter. with an attractive agate brooch for £20. Meanwhile, Thomas has made the journey ten miles east to Emsworth. He's heading to Emsworth Antiques and the very obliging Hillary. -Oh, I'm Hillary. Pleased to meet you. And he's already after the sympathy vote. -You've run out of money? but I'm desperate to claw back the money I lost last auction. So one is being, as one says in Somerset, careful. -Less of the sob story and more shopping, please, Thomas. -Come on, Plant. Where is it? Sometime today might be nice, Thomas. -No. No, I'm not struggling. No, I'm just picking myself up to sort of... Er, find something. How about something large and not shiny for a change, Thomas? or like a concrete, which has been weathered. They're both quite nice, really, aren't they? The frost has been at this, being a terracotta. -But that shows that she's been places, doesn't it? -It does. How much for these two? -How do you feel about 80? Oh, I haven't got £80. -You didn't tell me that! -Oh, not very much at all. -Well, make me a suggestion. Oh, I don't think they're worth a huge amount. Mm-hm. That's the death, is it? Well, they look as though they've died already. -What could you go to? I think they're great fun. 30 and we've got a deal. Or is that not going to happen? -I can't shake your hand because I'm busy. Have a head. £80 to £30 - now that's a great discount. and neither of them lost their heads. So, Thomas is finished for the day. Let's just have a little reminder of what he's bought for auction. Anita had another great day of shopping carefully. costing her a reasonable £100. So, let's hear what they think about each other's treasures. My favourite item of Thomas' is that wonderful Art Nouveau coat hook. I would swap it with my tribal figure. but because I think I might have paid a little bit too much for it. my favourite has to be the mixed lot of broken ceramics. because some restorer could do a real job, but it only cost her £20. so off to Dorking, 40 miles north. I hate to say it but I'm a wee bit ahead of you. You are a wee bit ahead. Just a wee, a wee hundred pounds! A wee hundred pounds indeed. Today's auction house is Crow's Auction Gallery. -so it's like an old antique itself. Oh, here we are, Thomas. Are you excited? -I am because I fancy crawling back. I never want to whack you, Anita! Our auctioneer is Tom Lofts. Has anything caught his eye? The African figure will be a challenging lot. I'm lost for words, but we'll give it a go. that they can get out of jail with, but it could be a struggle. but there's a lot of interest on the telephone and over the internet. First off, is the psychedelic Poole Pottery dish. -£10. Should double my money. Yes, yes. -Who'll start me here, please? -20, straight in? I've got it. And two and five and eight and 30 and two and five and eight and 40. -At 45. £45. 48 bid. Come on. 50 the bid. 50 bid. -Oh, he's pushing them on. -At £50 now. All out online as well. -In the room has it at £50. -For the Poole. I like this. -All done then, at £50. Yeah, baby. That's £40 of profit. I knew that I had a good one there. The rest of it has still to come. Next up it's Thomas' smoking set. -Will it set the auction alight, though? -We like this a lot. What do we say now? 40? 30? 20? Bid. -30, bid. 40 bid. Quickly coming in at 42. -48 bid. 50 bid. 55, 60 bid. 60 I'm bid. Selling at 60. All out online? At 60. -Thought we'd make a lot more on this. At £60. All done then at £60. Oh, just. But a profit is a profit. It's Anita's next item - the tribal sculpture. He didn't look that tall in the shop. -This is where I might fall down, Thomas. -20. 30, 40 bid. £40. There you are. You're into profit. At £40, being sold. At 40, I do not believe this. -You can't believe it, can you? -45 and 50 and five and 60. -There you are! Doubling your money! 60 in the room. Selling at 60. Selling at 60. Where are we now? -At £60, being sold. At 60. At 60. The line's all out. -I'm selling it at £60, all done. At £60. Doubled her money. Another excellent buy from Anita. Do you want a hanky for that wee tear? Come on, Thomas. You need the coat hook to get you off the hook. Telephone interest, I believe, here. And commissions with me. -Right, so here we start at 40. Can I say 70 bid on the telephone? Now telephone bid 70. And five. At £75. 80. 85 bid. £85. £85. With me, then. -Sold. All done. Sold at £85. Outstanding. That's got him right back in the running. -You're snapping at my heels. Not when you buy African figures which double their money. Now, will Anita's lifebelt portrait sink or swim? -but a very low start at 20. -22. 25. Don't get too excited! 28 bid. At £28. 30 bid. 32. 35. £35, liking this. There you are, you see? At £35, liking this a lot. At £35, out online. -I thought there'd be more interest away. -I thought there would be. Eight bid. 40 with me. 40 I have. Selling at 40. Still like this a lot. At £40 to be sold. Selling at 40. -Sold at 40. All done? At £40. That profit has got Anita's head above the water. -I'm a happy girl today. -I bet you are! Look at you. -"I'm a happy girl today..."
-It's just luck. It's just luck. -"I'm a happy girl, a happy girl today." Thomas' glass salts next - small but perfectly formed - how will they do? Away we go with me at 15. 18. 20. Two. £22. The salts. At £22. At 22. -Good, good, good, come on. At £28, the salts. At £28. All out online. 30 I've got. 30 I'm bid. -38 bid. 40. Now getting excited down the front. -Proper antiques. Proper antiques selling! -Selling at £40, the salts. All done. Sold at £40. Another profit for the Planter. That puts him in the lead. -You are a good boy. -Oh. I like to be a good boy. Is Anita's agate brooch going to push her ahead of Thomas? Commissions with me. A low start again at ten. 12. 15. 18. 20. 22. Yes, you're there. You going to double it again? Like all your other things? Triple? At 25, 25. 28. The lines are out. At £28. The brooch at £28. £30 bid. £30. £30 to be sold. Selling at 32. 35. 35 bid. £35. £35. £35 the brooch. -38 bid. 38. 40, I've got. 40. Selling at 40. -He likes you. Double your money. Another healthy profit, but she still needs more. Next for Thomas, it's the stone heads. -This is value at £20. 22. -She feels sorry for you. -25, bid. Come on, you can do it, madam. -At £28 in the room. 28 in room. At £28. -The telephone's on as well, 30 on the telephone. 32, 32. 35 bid, telephone bid. 38 can I say? Come again, you can do it. -£35. £35. Yes or no? One more! At £38. 38 I've got. £38 in the room. Selling at 38. 38 to the room. -I sell then at £38. A profit, just. Will that put him in the lead? Another big profit could put Thomas onto Easy Street here. My starter with me is a low start of 20. 32, 35, 38. This is a nice piece. 40. At £40 only. At 40. Still room to move here. At 40. Bid 42. -45. 45 bid. 48. 48 now. Can I say 50? 50 I'm bid. 50 on the telephone. 50 telephone bid. 50 telephone bid. 50 telephone bid. Still liking this. Disappointing but the lines have gone quiet. £50 on the telephone. 50 on the telephone. Selling at 50. -I'm selling. All done. Trading then, at £50. -Well done. That's a beauty. Brilliant stuff. That could be the lot that wins it for him. being held up. No-one had high hopes for this, even Anita. She needs a whopping profit here to beat Thomas. -And would you believe, commissions with me. -Now, what can I say. Away we go. 20. Two and five and eight. 30 in the room. 30 on the line. 30 online now. 30 online. 30 bid. 35 I've got. 35. 40 can I say? -35 bid. £35, you're out. 40, can I say? 40 can I say. Come again, the telephone. 40 I'm bid. -Come on, Tina. 45 bid. -Come on, Tina! £48. 50 can I say? 50 bid. -50 on the telephone. 50 telephone bid. 55. 60 on the telephone bid. 65. £65. At £70 bid. £70. £70. £70. At £70. 75 bid. -I feel I'm at the races here. -£80 bid. £80 bid. Telephone bid. 80 on the telephone. 85. -90 on the telephone. At 95. Come on! At 95, 95. -Please. Say please. All done? 95 on line one. £100. £100 bid. 110. At 110. 110. 110. -Come on, say please nicely. -She's done well enough. It's fine. On line one. Selling at 110. At 110. Selling at 110 to line one. Amazing. A perfect profit of £90 on the imperfect pottery. That means every item has made a profit today. Well done to our duo. But who has won the day and taken the lead? leaving him with a total of £261.84. with a total of £401.94. Well, Thomas, we both did well, but I'm still ahead of you. -You're ahead about £150 now. -But you're still snapping at my heels. Well, Anita, we started poorly. Surging ahead now. There's only one more chance now for Thomas to take the lead. and Anita knows how to compliment a dealer's collection. I had a little luck with some broken pottery before. Anita takes a break from shopping in Gosport to dive deep in to the history of submarines, while Thomas visits Southsea to hear a little-known story about the D-Day landings.